Iwata G-Series G6 Bottle Set Side Feed Airbrush-Gun - Spray Chart When airbrush projects call for larger coverage, look no further than the Iwata G-Series airbrush-guns. They spray with the fine atomization and air pressure of an airbrush, while covering larger spray areas. 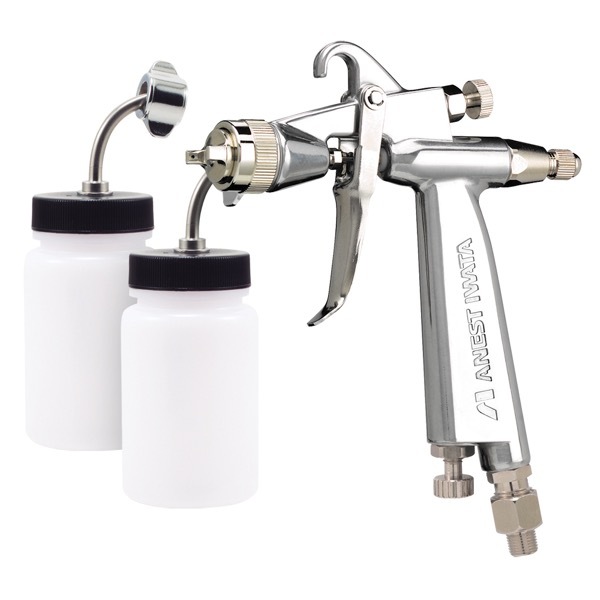 The G6 Bottle Set Side Feed Airbrush-Gun includes two 3 oz / 84 ml side feed bottles. The G6 Side Feed Airbrush-Gun comes with a 4.4 oz / 130 ml side feed fluid cup with lid. The G3 Gravity Feed Airbrush-Gun includes a 4.4 oz / 130 ml gravity feed fluid cup with lid. The G5 Gravity Feed Airbrush-Gun includes a 7.5 oz / 220 ml gravity feed fluid cup with lid.